Sheriff Al Murphy knew first-hand about Colorado gold fever. It was the madness glittering in the eyes of desperate prospectors; it was the terrible greed that spread like wildfire. And he suspected it was the cause behind the recent disappearance of Cincherville’s young Chinese laundryman – who had just discovered a rich gold vein. 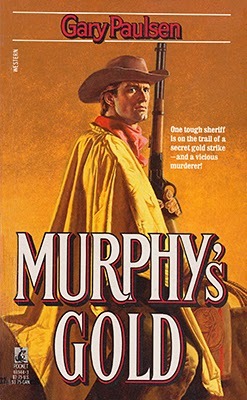 With a handful of petered-out leads, Murphy tracked the deserted canyons and gold-crazed town. Up against a trio of expert sneakshots and a deadly trap, he discovered a killer willing to stake his claim in more innocent blood. And Murphy swore he’d hunt him down no matter what the cost. If you haven’t read the first book in this series I’d suggest you do as this second book contains many spoilers to the first as Murphy is still trying to come to terms with what happened then to both himself and the town of Cincherville. As those dark events continue to haunt him Murphy questions his desire to continue as a lawman and of living in Cincherville. It’s whilst struggling to find the answers he is called upon to find a missing Chinese man. Gary Paulsen once more presents the reader with a tough storyline that sees Murphy finding his investigation turning up nothing. All he is sure of is that the young Chinese man’s wife knows more than she is willing to tell, even though she is the one who has asked him to find her husband. After being ambushed and shot Murphy’s determination to discover what has happened to Wangsu and why becomes a do or die mission. The story taking on a savage tone that leads to a deadly threat to Murphy’s future. Paulsen brings the tale to a close with an agonising brutal showdown that will surely leave Murphy with more scars to both body and soul. One thing that is for sure is that I’ll be reading the next book very soon. They call him ‘Hunter’ because he ruthlessly picks off men. But there is one man in particular for whom he searches: the man who destroyed his family. Catching up with the killer finds Hunter in a booming town in urgent need of a deputy sheriff and, in need of cash, he pins on the badge. But the body count is rising and the folk of Cimarron wonder just who they’ve hired as their peacemaker and when Hunter discovers why the town needs a fast gun so urgently the odds are that it will be too late for him to get out alive…. Dealing with the man who killed his family is the opening scene in what turns out to be an extremely fast moving read full of intrigue and violent action. Jake Douglas lets the reader in on a few of the answers to the puzzles that are troubling Hunter but doesn’t explain all straight away thus ensuring the reader will keep turning the pages. As well as the reason a man who should want Hunter out of town but seems happy to have him in Cimarron and working as a deputy, there is also the hostility aimed at Hunter by his landlady, a young woman whose brothers he killed some time ago. Can Hunter convince her it was in self-defence? Will he become friends with her? Possibly more? The conclusion of this particular relationship closes the book and, for me, will stick in my mind for a long time. Jake Douglas is a pseudonym used by Keith Hetherington, a prolific writer of westerns who always produces top-class reads. After having written many hundreds of stories I’m regularly astounded at how he seems to keep coming up with plots that seem fresh and new that leave me eager to read more of his work, as this one does. Five days after General Robert E. Lee’s surrender at Appomattox, President Abraham Lincoln is mortally wounded by an assassin’s bullet. Scattered Confederate forces ignore the armistice, determined to continue the Civil War despite the Union victory. American citizens, tired of years of bloodshed, want nothing more than to rebuild a country vulnerable to corruption and criminal enterprises. The first part of this book deals with the assassination of President Lincoln and the author includes a lot of historical information of the hunt for those who were behind the shooting. During this we witness how these events help persuade Gideon Ryder to agree to work for the just formed Secret Service. Although, at times, this section of the book does read a little like a history lesson, it also makes for some fascinating reading. Once Ryder is assigned to his case the story becomes full of intrigue, questions and action. And this is where the book takes on a different slant to many of the westerns I’ve read as a lot of this tale takes place at sea, which makes for some first-rate scenes on ships including a violent attack by pirates. Ryder easily infiltrates the gang he’s been sent to bring to justice, he isn’t interested in killing them or busting them up, his job is to find evidence so others can close them down. But with one of the gang members not believing he’s who he says he is it isn’t long before Ryder is fighting for his life. 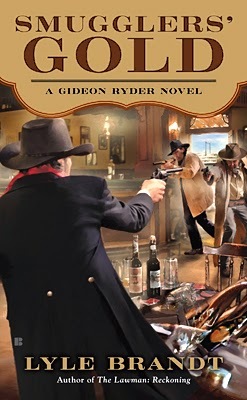 Lyle Brandt is a pseudonym used by Michael Newton and he sure knows how to write exciting action sequences such as the already mentioned pirate attack, along with a couple of terrific saloon shootouts. There’s also a spectacular scene where Ryder singlehandedly destroys a ship. Characters are well crafted and the story moves forward at an excellent pace. On finishing the story I find myself hoping it’s not too long before the second book in the series is published. 1854 -- the Gold Rush is still going strong. Who better to guide a wagon train from San Antonio to California than Jake Moran, the Hero of Chapultapec in the Mexican War? Trouble is, Jake's not really a hero, though he's the only one who knows it. Fifteen hundred miles of forbidding desert make Jake want to turn down the position, but the emigrants of the California Company are depending on him, and he can't let them down. The company faces thirst, cholera, and Comanche raids. In addition, Jake confronts the enmity of Tyler Hampton, wealthy promoter of the California Company, the man whose leadership position has been taken away and given to Jake. Jake may not be a hero when the company pulls out, but he better become one if they're going to survive. Originally published by Fawcett in 1987 as the second book in the series but now Robert Broomall has released the three Jake Moran stories as ebooks and has put them out in the correct chronological order, so Dead Man’s Crossing now becomes the first in the series. I like the idea that Robert Broomall decided to make Jake Moran a reluctant hero, a man whose reputation has been built up by others when in reality he didn’t do anything heroic, in fact fears facing an enemy and calls himself a coward. Circumstances see Jake having to stand-up for himself and chance sees that heroic reputation grow. 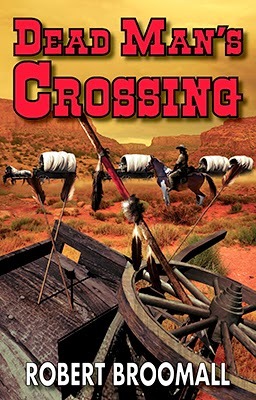 Robert Broomall creates a great sense of the dangers the desert crossing presents. I really felt the heat along with his characters, found myself in need of water. As the wagon train is reduced in size due to loss of animals and people I soon began to wonder how many, if any, would reach safety. Including disease as one of the threats, one they can’t see coming, adds an extra element to the story that plays on their minds, filling them with dread, urging them on to escape the desert whilst promising doom as the hopelessness of their quest takes hold. There’s lots of action as Moran has to lead the emigrants in defending themselves against the Comanches. The fights are savage and tense. If that isn’t enough Moran is constantly looking over his shoulder at the ex-leader of the train, and his men, as they would like nothing better than to see him dead. As the dangers of the trail take their toll these hatreds have to be put on hold as all must pull together if any of them are to survive. The book builds extremely well to the final confrontation that sees the last few travellers trapped, out of water and ammunition, surrounded by Comanches. On finishing this book I found myself eager to see what happens to Moran next, so I don’t think it will be too long before I read the next in the series. 1861, New Mexico Territory – no one stops an Apache out for vengeance. 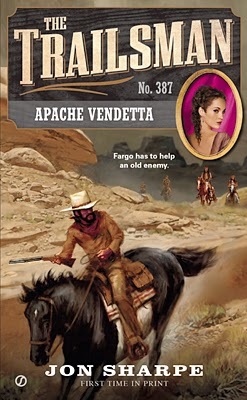 Years ago, Skye Fargo barely survived a scrap with an Apache called Red Knife. Now Red Knife needs Fargo’s help to find the white men who raped and killed his daughter. The army wants Fargo to do it so the Apaches will be pacified. But Red Knife wants blood, not justice – and the Trailsman soon finds himself caught between his orders and his old foe’s rage…. Trust, this is a word that Fargo has trouble with in this tale. How can he trust an Apache’s word that he will not kill those responsible for his daughters’ death? An Apache who is feared throughout the land, a brutal killer who says he will stop killing if the Trailsman helps him track down his prey. Jon Sharpe really piles the problems on for Fargo in this story, as it’s not just Apaches he has to keep his eye on, as the word is out of his mission and white men want his blood for helping a notorious killer. This all makes for some extremely tense situations and some exciting violent action. The author, David Robbins writing as Jon Sharpe, adds a few lighter moments to balance out the more savage aspects of this tale, such as Fargo being disguised as a woman to sneak into a girls’ home, a funny scene when you consider that the Trailsman has a beard. As this story gallops towards its bloody, and graphic, climax it becomes apparent that Red Knife is always a step ahead of Fargo. Can the Trailsman succeed in capturing the men he hunts and take them back to the army alive or will the double-crossing Apache fulfil his quest in killing those men slowly? That I can’t reveal here, but I’m sure fans of both the Trailsman series and David Robbins’ writing will enjoy finding out. The Gunsmith is being followed – but so far, his stalker hasn’t shown any sign that he’s got a mind to kill. Clint Adams has no clue as to the young man’s identity or motive, so the only thing killing him for the moment is his own curiosity. This book continues a storyline that started in the previous Gunsmith novel, Louisiana Stalker, but you don’t have to have read that one first to enjoy this book as J. R. Roberts includes just enough background information to explain what happened previously. Roberts expertly weaves this ongoing story thread into the plot of this book. Like the majority of Gunsmith books this is a very fast moving tale laid out in short chapters, of which most are about three pages long. This encourages the reader to read just one more chapter, then another, and before you know it the end has been reached. The main storyline is of the Gunsmith on a vengeance hunt, out to kill those who robbed the saloon and shot his friend, Rick Hartman. 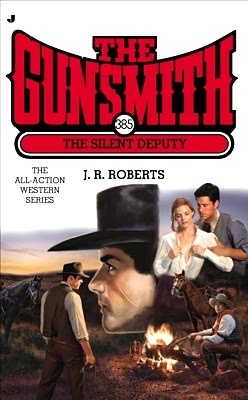 The straight-forward revenge plot is enhanced by having the Gunsmith’s stalker riding alongside him and further complicated by the reason behind the robbery and shooting. Does the Gunsmith find out who the Stalker is? Does he discover the Stalker’s reasons for tracking him? I don’t think I’ll spoil anything by answering both those questions with a yes, but I won’t reveal any more than that. Like many times before, when finishing a Gunsmith book, I was left feeling thoroughly entertained and eager to pick up another. Texas state marshal Trace Cavanagh has taken a big gamble: taking a prisoner – a notorious convict, called Raven – from the penitentiary to assist him in tracking down the deadly Arista gang and recovering the fifty-thousand dollars in gold they stole from a copper mining enterprise. Luke Cason, ex-gang member turned traitor, is now living isolated with his daughter Sally but it won’t be too long before the Arista’s arrive, seeking vengeance. Now Trace must do his very best to track down Regal Arista, recover the money and restore the safety of the plains. Most of the above blurb has taken place before the start of this book, in fact the opening scenes are of the Arista’s arrival at the Cason homestead. Sally’s escape provides some tense and gripping reading and her fear of blundering into the path of three riders makes for a taut encounter. From that moment on the story becomes a race against time as Trace attempts to get to the Arista’s before they retrieve the gold. Along the way his trust in various people will be tested as will his ability with a gun. 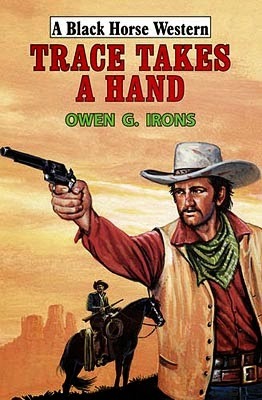 Owen G. Irons is a pseudonym used by Paul Lederer, a man who definitely knows how to hook a reader and keep them interested through excellent pacing, superb characters, exciting action, and plenty of twists and turns. I’m certainly glad that Paul Lederer is a prolific writer, meaning I won’t have to wait that long before reading another of his books, under whichever of his pseudonyms it appears. The year is 1864. Sister Thomas Josephine is on her way from St Louis, Missouri, to Sacramento, California. 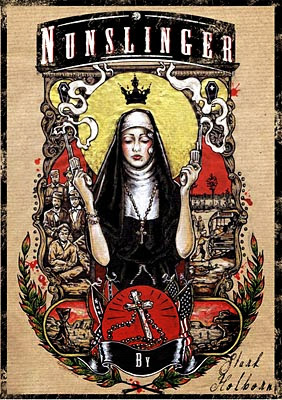 During the course of her journey, however, she'll find that her faith requires her to take off her wimple and pick up a gun. Innocent Visitandine nun Sister Thomas Josephine wants nothing more than an adventure-free journey out west. But adventure is what she'll get - and heaps of it - when she's taken hostage by a desperate outlaw on the Laramie Plains of Wyoming. Before long she'll find herself torn between two men, the handsome Union Army Lieutentant Thomas F. Carthy and the mysterious drifter Abraham C. Muir. And soon, one of these men will be staring down the barrel of her gun. I have no idea who is behind the pseudonym of Stark Holborn but whoever it is has written a gripping tale filled with well fleshed-out characters. The story is told in the first person through Sister Josephine. 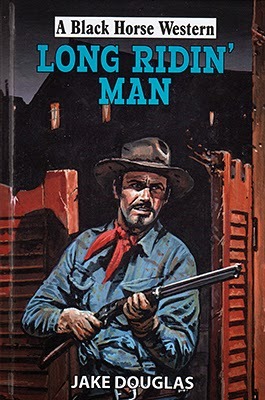 The superb series title, Nunslinger, and the cartoonish cover illustration hints at this perhaps being a comedy western but this isn’t the fact. The story is an action-packed traditional western with some hard-hitting scenes. Sister Josephine’s struggles to see more than goodness in people adding intrigue to the tale. The story is only just over fifty pages long and the way it ends, and that on the same day the next two books of similar length were released, makes me wonder if it was originally written as a full length novel and is being sold in parts. In fact an omnibus collection has been announced as have a further three instalments to be released on the same day in March. So why did I pick up a copy? The series title definitely got me interested and so did the price…or lack of. At the moment this first part is free and this great marketing ploy certainly has me considering buying the following titles.